A photograph of the Stockton KGH Football Team (date unknown) with the Stockton Sunday League Cup after a 1-0 victory over Oxbridge Hotel to complete a League and Cup double. Back Row: P. McAbe, D. Munt, S. Mallaby, P. Hodgekiss, ? ?, P. McDermotroe, T. Churchill, ? ?, P.Philips, A. Jones, A Kidd, ??. Front Row: S. Seymour, D. Smiddy, J. Louden, T. Smith and son, D. Wing. No indication of the year, are we left to guess by the haircuts 60’s, 70’s?. It was either 1973-74 or 1977-78. I think it will be 1977-78 because it looks like Tilery Sports Centre building, the finals used to be played on the Victoria Ground which closed in 1975. Could have been at Norton CC as that was a regular ground for local cup finals those days. This was quite a strong side in the league, the Preston S.C. lads mentioned were all good players plus most of the others played at Wolviston who were a top Stockton and District League side around the mid to late seventies. That year KGH, Oxbridge and Grangefield all finished the season on the same points so there was a 3 team play off to decide the league winners where KGH won both games 3-0 to claim the title. 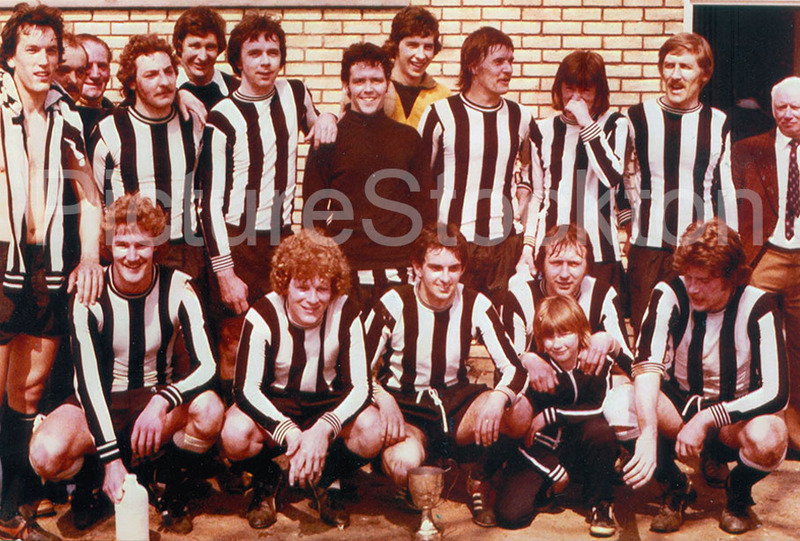 Quite a few Preston S.C. stalwarts in this team Peter Phillips, Terry Smith, Steve Seymour, Alan Jones, Alan Kidd, P. Hodgekiss & Dave Munt, Dennis Wing, Billingham Social & Synthonia, also Peter McCabe of Stockton Buffs. Bob, you must of been playing for a Thornaby team then.